Beautiful Bamboo. 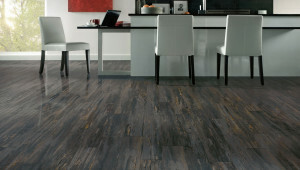 If you have an earthy color palette, consider bamboo plank flooring. Bamboo reflects light, keeping the room airy and bright. You can find renewable bamboo floors in various sizes and patterns to complement your kitchen styles. Bamboo can also be stained in a variety of colors. Limestone Offers a Casual Finish. Consider a matte or honed finish if you opted with limestone floors for your kitchen. This kind of finish provides the room with a more peaceful look and feel. This kind of flooring also hides scratches, needs minimal maintenance, and gives added traction when wet. Comfortable Cork. Cork flooring is durable, quiet and cushiony, so it is easier on your joints. It costs almost the same as hardwood, and has a unique ecological advantage: sustainability. Cork trees regenerate in just nine years, while other trees can take up to 30 years or more. Engineered Wood. Consider engineered wood over laminate or solid hardwood. Light flooring with white-washed cabinets create a cool monochromatic color. Engineered wood is best in rooms with potential water issues as it shrinks and expands less than solid woods. Traditional Hardwood. Wood floors gives character and warmth to a room. If you want wood flooring in your kitchen, remember that solid woods are vulnerable to moisture and warp with repeated exposure, so put a rug near your food preparation and clean up zones to catch any spills. Treatingthe wood with a sealant is highly recommended. Stylish Slate. Large slate tiles give a stylish and sound surface underfoot. Its color is also great for hiding hair, pet fur and more. To maintain it, reseal it with a matte-finish product annually. The type of stone you choose and where to put it determines if you need to seal it. Try Travertine. 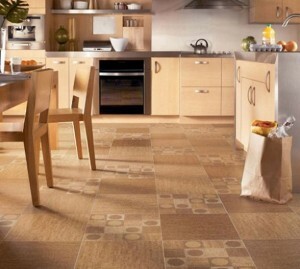 Travertine tiles add an elegant touch to any space. Maintenance is as easy as yearly sealing, monthly wet mopping and dry sweeping a few times a week. Polished travertine is virtually stain-resistant and is a good choice for high-traffic areas, such as a kitchen. These are just a few of the kitchen flooring ideas with many more options available today. You can look for other kitchen designs with style online. And while you are at it, consider adding under cabinet kitchen lighting to further compliment your flooring choices and custom wood kitchen cabinets.